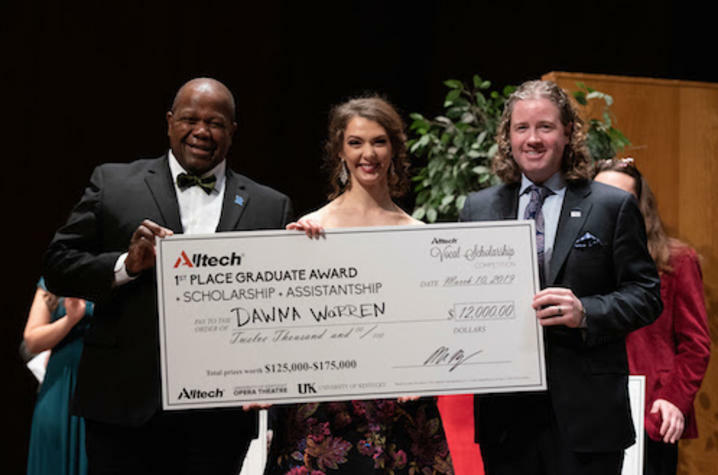 UK Opera Theatre Director Everett McCorvey (left) and Mark Lyons, president and CEO of Alltech, congratulate Dawna Warren on her Alltech First Place Graduate Award. Photo courtesy of Alltech. LEXINGTON, Ky. (March 15, 2019) — Twenty-one undergraduate and graduate students took the stage at the 14th annual Alltech Vocal Scholarship Competition to sing for their chance to win scholarships to University of Kentucky and prizes that will jumpstart their operatic careers. Alltech’s founder, Pearse Lyons, was an avid supporter of the arts. In 2006, he initiated what is now one of the largest vocal scholarship programs in the world. After his death, the Lyons family still considers education to be a critical investment in community and the world around us. • Encouragement Awards: Trinity Peace Hines-Anthony, Dayton, Ohio, and Amber Rogers, Washington, D.C.
• Transfer Student Encouragement Award: Kellie Sherwood, Lexington. • Encouragement Award: Myah Rose Paden, Athens, Georgia. Finalists were scored on voice, technical skill, interpretation, accuracy and appearance by three judges: Barbara Lynn Jamison, Kentucky Opera’s chief artistic and executive officer; Susanne Marsee, one of New York City Opera’s leading mezzo sopranos; and Thomas King, a tenor who has sung in five world-premiere operas. The 2019 competition held March 10 at UK’s Singletary Center for the Arts awarded more than $740,000 in prizes. Launched in 2006, the annual competition at UK marks a continued partnership between Alltech and UK Opera Theatre. Since its start, more than 150 students have received over $1.3 million in cash prizes and over $5.6 million in scholarships and assistantships. This totals more than $7 million in collaborative investment into the lives of students who want to pursue a career in the arts at UK. “This time last year, we had just lost my father,” said Mark Lyons, president and CEO of Alltech, during the opening remarks. “It was right here that I gave my first public speech after his passing. I have to say, giving that speech — and feeling the support from the community and the vocalists who shared their talent on this stage — inspired us, and exemplified the legacy that has been built here. UK Opera Theatre is part of the School of Music at the UK College of Fine Arts. The school, currently celebrating its 100th anniversary, has garnered a national reputation for high-caliber education in opera, choral and instrumental music performance, as well as music education, music therapy, composition, and theory and music history.